Web Desk(September 04, 2018): A Georgian teenager broke a Guinness World Record by solving six Rubik’s cubes under water in 1 minute, 44 seconds. A video of the record attempt Friday at the Gino Paradise water park in Tbilisi shows Vako Marchelashvili spending 1 minute and 44 seconds submerged in a water tank and solving the six puzzles in a single breath. Margvelashvili said he trained for several hours each day for about six months before the record attempt. 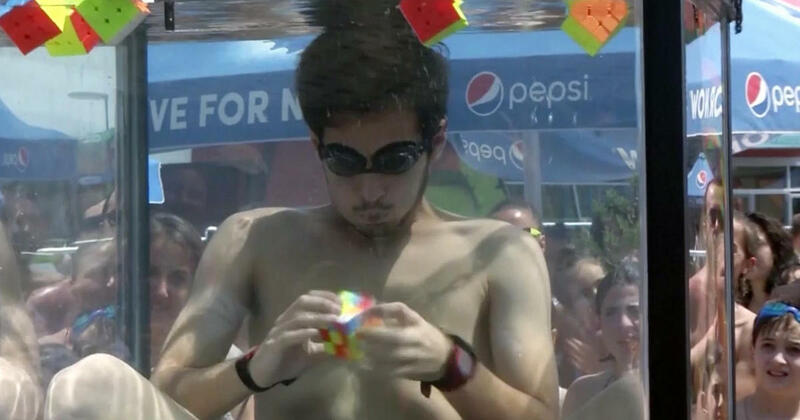 Evidence of the feat has been submitted to Guinness, which currently lists the record for most Rubik’s cubes solved underwater as five. The record was set by New Jersey resident Anthony Brooks in 2014.